I did say I would not post every day… but I do mean to post more than once a month! Oh, yes, the sewing pile, which is still a pile. BUT the alterations pile far surpasses it. OI!! I have enough experience to know to sew garments only after the undergarments are made. What I did not reckon in The Edwardian Everyday Project was how much a new corset (and, full disclosure, a health-required change to a vegan/vegetarian diet) would change my shape. This may have been obvious to most of the rest of the world but it was not obvious to me. What can I say? So, I’ve exchanged the original beautiful corset for another …and then another. Yep, three different corsets in two months. I have taken in the blue wool skirt three times since I started this project. 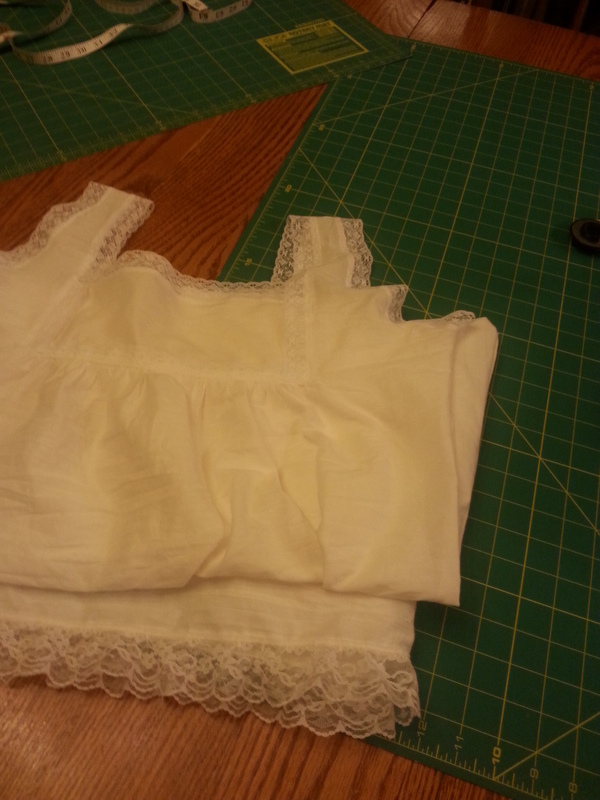 Three shirtwaists have been newly french seamed and could use still more alterations. The cardigan that fit so smartly at first is sagging now. I stopped sewing the other outer garments because my measurements were almost immediately smaller than when I cut them out! Unheard of!! So I am making do for the time being until my form stabilizes. No new photos for a while, sorry. And now I will begin The Historical Sew Fortnightly. Late but better than never, right? The current challenge is Under it All and is due 1 March. More underwear is always a Good Idea. (And I am not counting the completely handsewn linen braies I finished for Darling Husband during a particularly looooong Court at the Stellar University of Northshield. I’m doing all Edwardian for the HSF.) I have ideas for all the remaining challenges which I will detail in another post… however I consider myself to have successfully accomplished the first challenge of Make Do & Mend!!! (grumble, changing shape, grumble, grumble) By far the largest part of that challenge has been the alterations/making do to accommodate my changing form. Have I mentioned that I hate alterations? And I mended a chemise which got eight little kitty claw holes while hanging to dry in the hallway. No idea which of the four was the naughty kitty! I should also come clean. I did not wear Edwardian while traveling to Stellar University of Northshield nor did I wear Edwardian during the family waterpark getaway or while in bed sick for the past two days. Wearing a corset while riding in a Model T (Hey Ira Hill! I have a new duster! Let’s go for a spin!) was easy the last time I did it because of the flat and firm support of the bench seats. Wearing a corset while riding in a modern car with bucket seats is… well, the nicest word to put here is “not”… easy. I didn’t want my travelling companions discomfited by constant adjusting of the seat or a crabby momma. Every other day has been all Edwardian all the time! And as this post has been rambling about anyway…. Most strangers I meet do not comment on my clothes. I find that interesting. But it is winter and I’m pretty well wrapped against the cold. 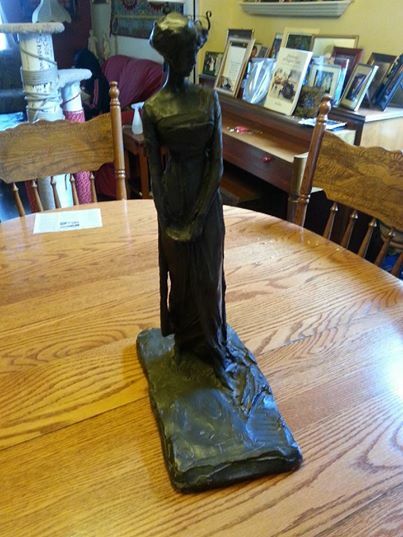 While returning a sculpture to the library, someone commented that the piece, ‘Portrait 1910’, by Pierre Troubetzkoy, could be of me. I must have the correct silhouette, hair to shoes! Huzzah! I have one and only one very odd comment to report which was made by a total stranger at the grocery store, “White Diana Ross! You are the white Diana Ross!” I admit, it took a long while to realize he was speaking about me. He was walking away pointing at me by the time I realized. I guess my hair is …big? Hmm. I still don’t know what to make of that. Most of the people I know have thought my clothes are beautiful and I do love hearing that about my sewing. I ran into a parent I knew from the PTO the other day and her comment was first an incredulous, “What are you wearing? !” and immediately “You look like you stepped out of a picture!” so that was good. No new photos for today. 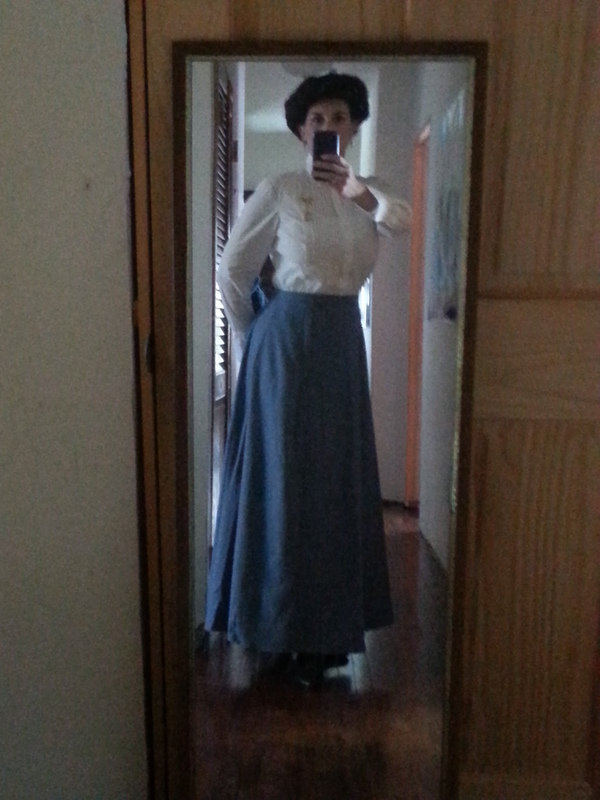 We cleaned the house a la FlyLady Weekly House Blessing last Thursday and I did the cleaning in my whole Edwardian get-up. I now also want to make one of the housekeeping robes for such times. I’m not fighting coal soot and dust from unpaved roads, but covering my sleeves while scrubbing toilets and vacuuming does seem smart. I also made two new hair rats. These are meant for the pompadour style so they basically make the pouf in front. I still had some saved hair left. I’ll keep adding it from my brush as our grandmothers did until I have enough to make the next shape/size rat. I want to do the side poufs from the center part, but I need to do more research on how that’s done. I have quite an alterations pile. My new corset is changing my shape and two of my shirts keep sliding up. I’ll french seam the sides as that seems the easiest way to make the alteration. I also need to take in my blue wool walking skirt. I hadn’t planned for much change in my waistline since I don’t consider myself to be tightlacing… I’m not terribly constricted at any time in my corset just comfortably hugged and I don’t sleep in it. Still I’ve lost an inch or two – enough to make my skirt slide down far enough that I trip on it if I’m not careful on stairs. My posture has improved a lot also. I do remember one method of fixing the shirt sliding up… there was a belt advertised in the 1908 Sears Catalog that had grippers which would keep shirt and skirt in place. But I need a copy of that catalog to see exactly how it was made. I ordered one from ebay but it hasn’t arrived yet. Well, back to cutting out more clothes!! Whee!! Serge Your Late Victorian and Edwardian Clothing! My mother has an extensive antique and vintage clothing collection. One day while studying construction details I noticed that the entire skirt of a ladies suit (c1890) was serged! I realized I didn’t know when sergers were invented. A quick check on my phone dated the invention of sergers (or overlock machines) to 1881 and the patent dated to 1889. The machine was invented by Joseph Merrow and such machines are still made today by the company that bears his name. We think the suit that led me to this information is one of the many which were offered ready to wear from catalogs back in the day. This suit is brown wool with a grosgrain ribbon trim. The overlock stitch used on it is a three thread stitch, but when I make my clothes I leave my serger with four threads. Makes me feel safer to have two seams! Problems already… I need more clothes!! 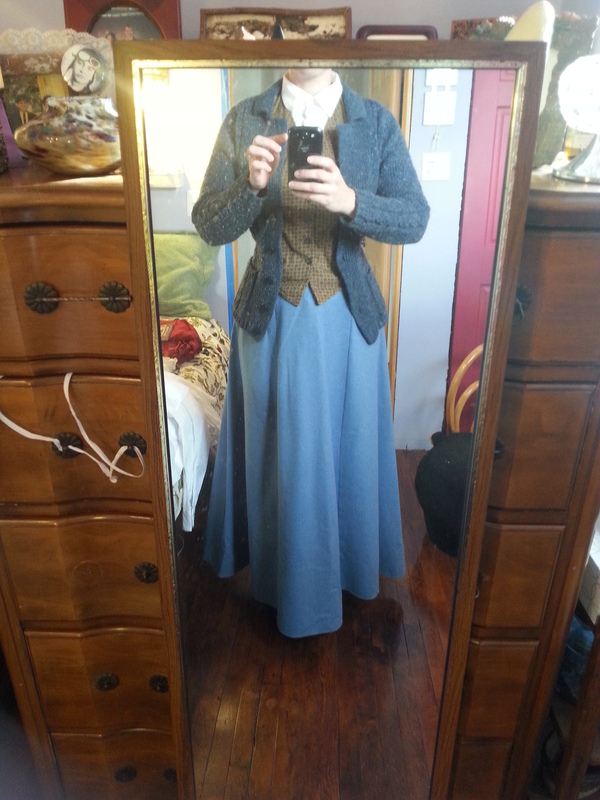 Today’s outfit illustrates how long I have been collecting, making and wearing Edwardian clothes. You’ll notice in the photo that I am wearing a vest. The vest is vintage, altered years ago to accentuate my more youthful form, and it could do with a little more alteration. But today it very helpfully covers the button on my shirt that I cannot close. That discovery made me realize that I probably haven’t worn this shirt in over a decade. Sigh. Meaning prior to having kids. So my sewing for the week ahead includes not just an apron and new combination, but apparently more skirts and shirts which fit completely. Tonight will probably include trying on All.The.Things., because where I thought I had several days of outfits, obviously I can’t count on things I wore ten years or so ago. I am sure the new corset is cause for some of the change in how my clothes fit but not for all. My first corset was stolen while we lived in what we call “The Fat House” (a story for another time) and in its shared basement apparently many of our storage tubs were rifled through. The second one was a cheapo purchased because I didn’t have the first one and couldn’t fathom wearing my Rollag clothes to the first TeslaCon without one. And now I have a new proper corset with steel bones and silk satin loveliness. I also altered the sweater yesterday. I may not post for a few days for all the sewing I now have to do. So, I need an apron. It’s not that I’m particularly sloppy. But I can’t see my front below the …’crest’ shall we say. And I cook. There are six mouths here to feed so I cook a LOT. And I have fancy new clothes on today. So making a normal dinner, with its usual splatters and slops, made me feel like a real butterfingers which required several checks in the bathroom mirror to assess potential damage. So far it’s limited to something unknown and black on the cuff of my white shirt. I hope I can get it out. Photo for today below. Credit to my husband, helping me out while I figure how to take these photos. I look fabulous. I feel fabulous. I am dressed in Edwardian clothing and I love it. I could say it started with Sarah Chrisman’s book “Victorian Secrets: What a Corset Taught Me about the Past, the Present and Myself”. But it really didn’t. I could say it started at TeslaCon. But it really didn’t. It started at Rollag, also known as The Western Minnesota Steam Thresher’s Reunion. My dear old Dad took us when I was eight years old. By the next year’s show, he had bought a steam engine and we were lifetime members shortly after that. We went every Labor Day Weekend for the rest of my childhood and I’ve gone every year for most of my adult life so far. But my mother is really responsible for the clothes. My mother is an amazing seamstress. She sees a drawing or a photograph and fabric turns into whatever she wants it to be. The ladies at Rollag dressed in ”prairie dresses”, long skirts and blouses made of calico were the order of the day in the late 70s. And she dressed herself and us kids up in those ‘old’-style’ clothes for Rollag. And every year she made new outfits. I had a bustle skirt made from men’s dress pants, matching mother-daughter capes from an old faux fur coat, parasols, purses, and hats…. oooh, the hats!! My brothers got cutaway coats made from men’s suitcoats, canes and tophats. We also started collecting antique clothing we would find at thrift shops and antique stores. And it was a very good thing we started collecting that clothing. There was a ‘Style Show’ at Rollag. It was one of the “Ladies Activities”. A lady from Chicago brought her collection of antique clothes and volunteers would come and model the clothes while she emceed the show. I was absolutely entranced with the clothes. And. You. Got. To. WEAR. Them!!! Squee!! Only for a few moments, but it was honestly a slice of heaven. I usually modeled the walking costumes from the 1890s when I started modeling in the show. I was probably almost 5′ and stick thin. My tiny waist fit right into those tiny little costumes. I looked forward to modeling in the Style Show all year long. And one year, the lady from Chicago didn’t come! I was so disappointed I think I cried. My mother drove home in our pickup with the camper top and packed up all the antique clothes we had collected, and brought them back to the showgrounds. My dad rigged up a curtain for us to change behind and we did the Style Show. There weren’t any 1890s walking suits, (and no slinky, silk-fringed, Marilyn Monroe dress, more on that later) but it was fun just the same. Outside of the Style Show, I still dressed up in my bustle dress and “fur” cape. People always stopped us for a photograph and that was always a treat. Over the intervening years, my mother has continued to run the Style Show, fighting for its place at times. Those are stories for another time. And as I got older, I tried to wear clothes from the same era as our steam engine… so I would ‘match’ while running it. Suffice it to say, my current plan was born long ago. So what is my current plan? I will wear what I want, clothes that make me feel pretty amazing. I will wear Edwardian clothing, from the skin out, as correct as I know how and can afford. A bunbury from the modern mom uniform of jeans and a stretchy (sometimes maternity) top, a topic for another day. I’ve been preparing for a few weeks now. 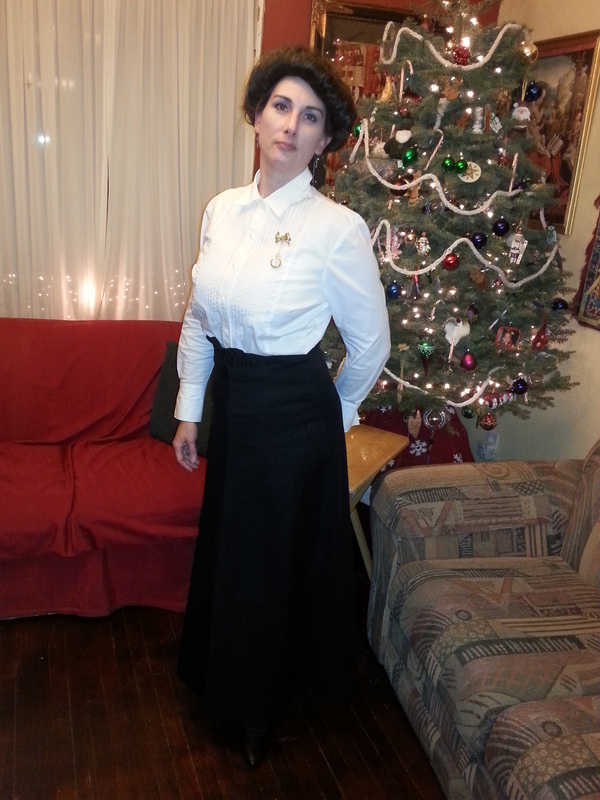 Because of Rollag and TeslaCon, I have a good four days of full on Edwardian clothes. However, some of the pieces I wear are actual antiques and while I will wear them a few times a year (taking that slim chance that some horrible accident may destroy something precious but feeling fabulous all the same), I cannot take that chance 365 times in a row. So I have sewn a new chemise and (Happy Christmas!) have received a new corset and new (better) shoes. I will be replacing the corset covers and combinations because, while they are not antiques, they are re-creations of almost thirty years age – well, I guess they ‘may’ be considered “vintage” – OI, I have been doing this a long time!! But anyway, since those pieces were made for another lady, they have never fit me perfectly. I will be sewing a lot of new clothes this year. So this blog will be a record of this year, with photos as often as I wear something new. I will not promise to post every day, but this is the focus of my year. Let us see what it brings!